MBC's upcoming Wed-Thurs drama 'W' held its first script reading session. This drama is already well-known as the comeback drama of actor Lee Jong Suk and actress Han Hyo Joo. Jong Suk will play the male lead named Kang Chul, who is CEO of a venture capital firm. Hyo Joo will star in this drama in the role of heart surgeon, Oh Yeon Joo. 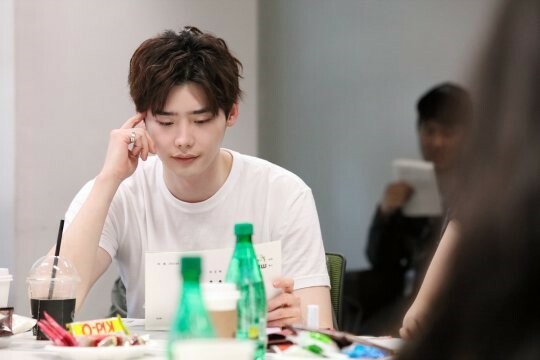 The cast of 'W' including Lee Jong Suk, Han Hyo Joo, Jung You Jin, Lee Tae Hwan, Park Won Sang, Cha Kywang Soo, Kim Eue Sung, Lee Si Un, Nam Ki Aae, Huh Jung Do and Kang Ki Young all attended the script reading session. Writer Song Jae-jung taught acting skills to the cast before they started the rehearsal. 'W' was written by writer Song Jae-Jung, who wrote TvN's drama 'Nine : Nine time travels.' The producer of the drama 'She Was Pretty,' Jung Dae-Yoon, will be in charge of production. The first episode of this drama will be broadcast on July 20 at 10 p.m. KST on MBC! prev'Lucky Romance' made Happy Wednesday, Thursday!